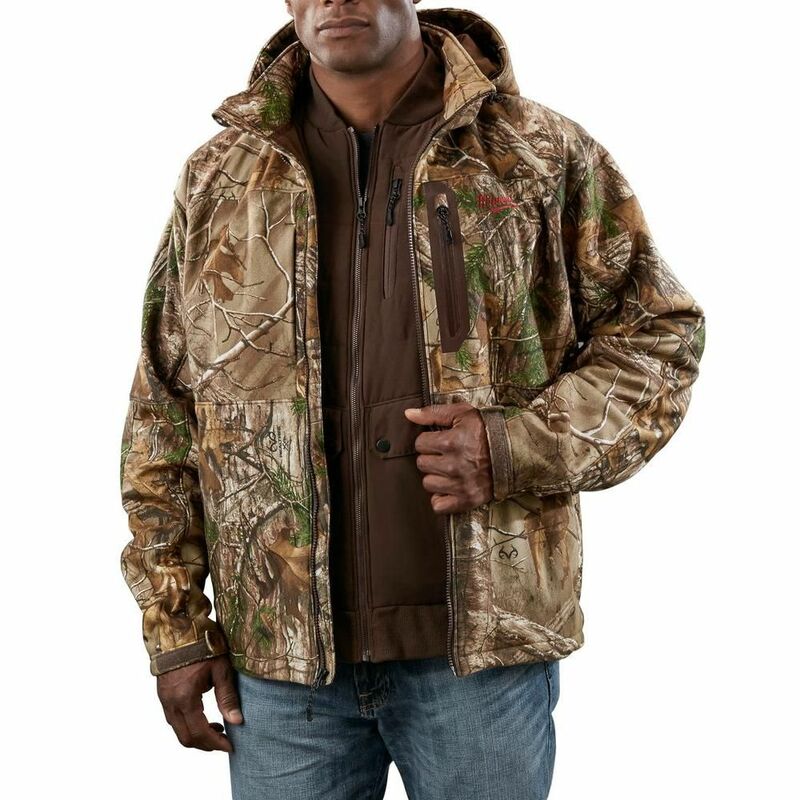 Milwaukee<sup></sup> M12 Realtree Xtra<sup></sup> Camo 3-in-1 Heated Jacket: The first customizable heated jacket system designed for the outdoorsman, the Milwaukee<sup></sup> M12 Cordless Realtree Xtra<sup></sup> Camo 3-in-1 Heated Jacket sets a new standard in cold-weather performance and versatility. Worn separately as a base layer or attached to the outer shell and zip-off hood, the heated vest integrates (5) carbon fibre heating elements and advanced fabric-layering technology to distribute and maintain heat across core body areas. The rugged wind and water resistant shell features special noise-reducing fabric with the Realtree Xtra<sup></sup> Camo pattern. Made out of the same weather-resistant material, a removable hood helps keep heat in and provides additional protection against the elements when added to the shell. Powered by M12 REDLITHIUM Batteries, It also includes a fuel gauge to check your battery life and built-in USB port for charging portable electronic devices. All pieces are washer and dryer safe. M12 Cordless Realtree Xtra Camo 3-in-1 Heated Jacket Kit -2X Milwaukee<sup></sup> M12 Realtree Xtra<sup></sup> Camo 3-in-1 Heated Jacket: The first customizable heated jacket system designed for the outdoorsman, the Milwaukee<sup></sup> M12 Cordless Realtree Xtra<sup></sup> Camo 3-in-1 Heated Jacket sets a new standard in cold-weather performance and versatility. Worn separately as a base layer or attached to the outer shell and zip-off hood, the heated vest integrates (5) carbon fibre heating elements and advanced fabric-layering technology to distribute and maintain heat across core body areas. The rugged wind and water resistant shell features special noise-reducing fabric with the Realtree Xtra<sup></sup> Camo pattern. Made out of the same weather-resistant material, a removable hood helps keep heat in and provides additional protection against the elements when added to the shell. Powered by M12 REDLITHIUM Batteries, It also includes a fuel gauge to check your battery life and built-in USB port for charging portable electronic devices. All pieces are washer and dryer safe. M12 Cordless Realtree Xtra Camo 3-in-1 Heated Jacket Kit -2X is rated 4.5 out of 5 by 2. Rated 4 out of 5 by Omicron from great product! Fits well, and so warm. Even just the outer jacket by itself is great. I tested everything together, but it hasn't really been cold enough to justify the heating vest yet. My wife found it toasty! USB charger is a great feature since my phone battery is on its last leg. The only thing I would change is an issue with a lot of jackets I find. The lining of the arms is loose. When I slip the jacket on, I end up with about 3/4" of lining scrolled out around my wrist. It just bugs me. I end up reaching up by my arm pit and pulling the extra liner back up my arm. I wish the liner was somehow quilted to the sleeve or just more stiff. My guess is that most people wouldn't even notice. There are lots of pull string adjustments on the outer jacket and hood. It is easy to make it fit if you don't like the baggy feel/look. Possesses a plethora of pockets! Rated 5 out of 5 by Anonymous from Better than I thought possible. Being an out-doors person on Maine is not always easy. This jacket system make below freezing treks into the wild a much more comfortable event. My wife liked it so much she borrowed it for Black Friday shopping. And then she went and bought her own heated hoodie. I would highly recommend this product for anyone who spends time in cold areas.